Despite shutdown authorities continued to find drugs. In the final days of the partial government shutdown, federal law enforcement officials in Cameron County seized nearly 1,268 pounds of various narcotics — all while working without pay. The seizures include marijuana, methamphetamine and cocaine and are the result of nine arrests that include 10 weapons and two kits of gun parts, federal court documents and hearings over a five-day span between last Sunday and Thursday showed. The actual amount of seized drugs could be higher as escaping smugglers sometimes abandon loads or criminal complaints aren’t immediately filed to further investigative efforts. Two of the arrests occurred near the border wall, one was the result of a traffic stop, three seizures occurred at international bridges and two incidents involved stash houses, court documents show. The busy week for federal agents ended with a deal to re-open the government between President Donald Trump and Democrats until Feb. 15 to allow both sides to negotiate over the president’s demand for $5.7 billion to build a border wall. On Dec. 22, the government partially shut down after Trump declined to sign a bipartisan funding bill because it didn’t include funding for a border wall. The shutdown lasted 35 days, the longest in U.S. history. But for federal agents working on the border, it was business as usual — especially last week. On Sunday, U.S. Customs and Border Protection encountered Sandra Sanchez-Marin as she entered the United States through the B&M International Bridge. CBP officers discovered a little more than 144 pounds of liquid methamphetamine and turned the woman over to federal agents. During an interview with investigators, Sanchez-Marin said she thought she was transporting marijuana and said she was going to be paid $3,000 upon delivery at a busy public location. To increase her confidence, she drove the vehicle through the port of entry multiple times to create a crossing history and reduce her chances of being questioned while increasing her confidence. At another port of entry on Sunday, CBP officers met Floridian Prisila Valencia as she entered the country at the Los Indios International Bridge. Valencia’s passenger would end up being the undoing of this smuggling event as that passenger triggered a computer-generated alert that prompted CBP officers to refer the woman to secondary where an inspection revealed 46 bundles of marijuana hidden inside the vehicle’s spare tire and gas tank, according to a criminal complaint. She told federal investigators she attempted to cross the approximately 112 pounds of marijuana for financial gain, court documents indicate. At around 10:35 a.m. Tuesday morning a Border Patrol agent on routine patrol near South Point and Nursery roads spotted a black vehicle exiting from a gap in the border wall traveling north from the Rio Grande. The agent saw three people in the vehicle, which was in an area known as the “Nursery Gap.” In particular, driver Ismael Recio, who avoided eye contact with the agent while firmly gripping the steering wheel, caught the agent’s eye, according to a criminal complaint. The agent reported in court documents that he made a U-turn and conducted a traffic stop and immediately saw a large bundle in the vehicle’s back seat. After the agent placed Recio under arrest and was detaining a 15-year-old juvenile, the remaining passenger in the vehicle fled back to Mexico, “escaping justice,” the criminal complaint states. A search of the vehicle turned up five bundles of marijuana weighing a little more than 245 pounds. The agent turned the juvenile over to Cameron County constables. Homeland Security Investigations special agents conducting surveillance on an undocumented immigrant Tuesday ended up making a drug bust with assistance from the Brownsville Police Department. After the Brownsville Police Department stopped Cristian Delgado-Reyes for a traffic violation after he left his residence, he admitted that he had drugs, according to a criminal complaint. HSI special agents reported in court documents that they found five plastic containers that held methamphetamine, along with a small bag containing the drug for a total of 13 pounds. Delgado-Reyes told the investigators that he was storing what he thought was cocaine for a friend and was going to turn it over to an unknown person at 1 p.m. and would earn $600 for the favor, according to the criminal complaint. After receiving two gun kits containing 5.56 caliber upper receivers in the mail from United Parcel Service, Nicky Lee Quiroz allegedly tried to enter Mexico. 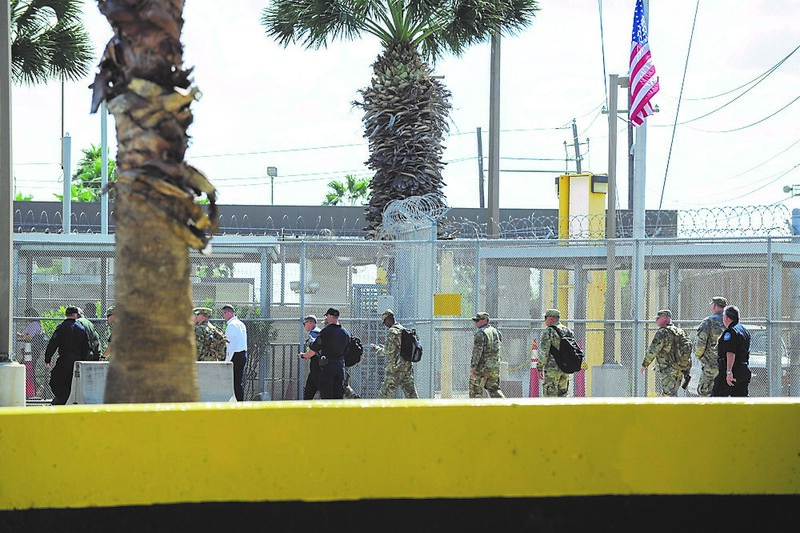 Homeland Security Investigations special agents learned she had received the kits at approximately 2:20 p.m. and watched her leave her residence at 4 p.m. and attempt to enter Matamoros via the Veterans International Bridge, according to a criminal complaint. She did not make it far and told investigators she would be paid $600 upon delivery. Drug Enforcement Administration and Border Patrol agents keeping a close watch on a Brownsville residence early Wednesday morning ended making a bust that included cocaine, marijuana and three pistols. The federal agents reported in a criminal complaint that the Cameron County District Attorney’s Office stopped a Chevrolet Tahoe just after 7 a.m. for a traffic violation after it left the residence and discovered two people, including an undocumented immigrant who had a baggie of cocaine. DEA and Border Patrol agents knocked on that residence’s door and gained consent to search where the authorities discovered Daniel Pena-Chavez, his wife, Cynthia Nayeli Quezada-Cortez, and the couple’s three children, court documents indicate. A search of the residence turned up 25 bundles of cocaine that weighed a little more than 63 pounds and two bundles of marijuana weighing a little more than 40 pounds inside the master bedroom, where investigators also found three pistols inside a drawer, according to the criminal complaint. Pena-Chavez told investigators he was paid $50 a kilo that he received at his residence and had been receiving and transporting cocaine for five months while Quezada-Cortez told investigators she was aware of her husband’s activities and said he had been doing it for three months, according to the criminal complaint. A Border Patrol agent patrolling the Rancho Grande neighborhood in La Paloma Wednesday night noticed shoe impressions in the soil south of the border wall that lead over the structure. Video surveillance captured someone within the vicinity of the agent, who was apprehended, according to the criminal complaint. Border Patrol sent out three drug-sniffing dogs to the area, which is a known smuggling route, and discovered three bundles of marijuana to the east of where the agent apprehended Angel Garcia-Hernandez, court documents indicate. Agents found cuts and bruises on the Matamoros man’s arms and back which authorities said are consistent with crossing over the border wall, according to the criminal complaint. Investigators say Garcia-Hernandez admitted to smuggle a little more than 215 pounds of marijuana for $200 — less than a dollar a pound, court records indicate. An irregularity Tuesday inside the gas tank of a vehicle driven by Lilia Nattaly Rivera led authorities from an international bridge in Brownsville to a Harlingen stash house. CBP officers who encountered Rivera at Veterans International Bridge discovered a non-factory compartment in the vehicle she drove and at some point she told investigators that she had been using it three times a week for seven months to smuggle drugs to the Harlingen residence for financial gain, including that same day, according to the criminal complaint. With that knowledge, Homeland Security Investigations agents conducted a search and seizure warrant at the Harlingen residence and seized a little more than three pounds of cocaine, approximately 431 pounds of marijuana and seven firearms while arresting Alonso Garcia Limas, court records show.